The climate report is required every four years by Congress, is completed by 13 agencies, and is reviewed by the National Academy of Sciences. The report is vast, with 29 chapters, 5 appendices, and non-technical summaries for all of these. The first volume was the Climate Science Special Report last year. It is now 1.8ºF warmer than 100 years ago. Sea level is 9 inches higher than 50 years ago. In the US 48 states, the land by 2050 could be 3º-5º F warmer. Key crops will have declining yields. Much less snow will be retained in mountains in the West. Alaska is warming and increasing the thawing of permafrost in the tundra. There will be more mosquito and tick borne diseases. US coral reefs will be bleaching in the Caribbean, Hawaii, and Florida. On the right is the business-as-usual without climate change intervention RCP 8.5 result of maximal greenhouse gas emissions. 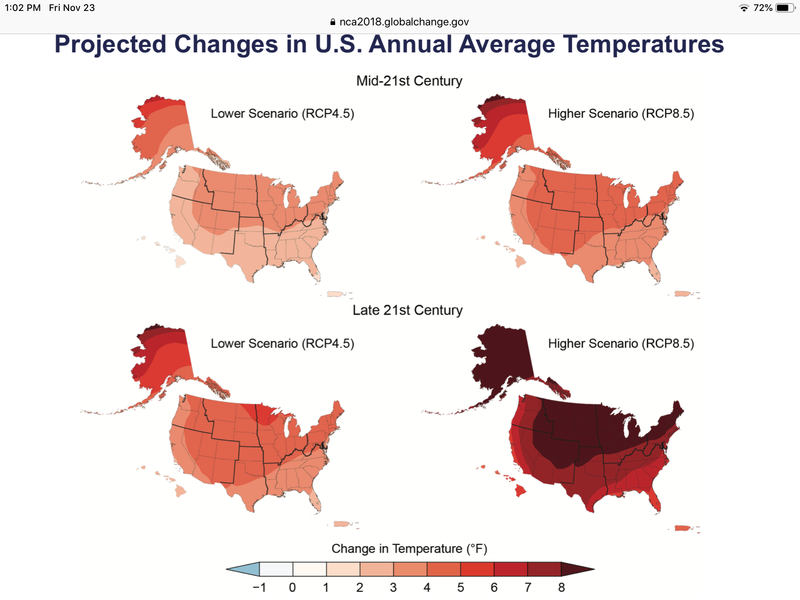 We see that by the end of the century, in the case of RCP 8.5, the dark red in the Northern US and Alaska will have a temperature rise of 8 ºF or more. California would be 6º-7º F warmer. By mid-century, the US would be 3º-5º warmer, with California being 3º-4º F warmer. Technical note, RCP 8.5 is a greenhouse gas pathway where in 2100, the climate forcing over background is 8.5 W/m^2. Currently, it is about 2 W/m^2. In a map of percentage changes in hours worked, due to higher temperatures, in the West and Northeast, loss will be 2%-3%, but in the Central and Eastern areas the loss will be 3%-4%. In the South, the loss will be 4%-5%, exceeded with more than 5% loss in Southern Texas and Florida. So current Republican states get hit hardest. Many businesses just scrape through with 5% profits, so this is more serious than it sounds. 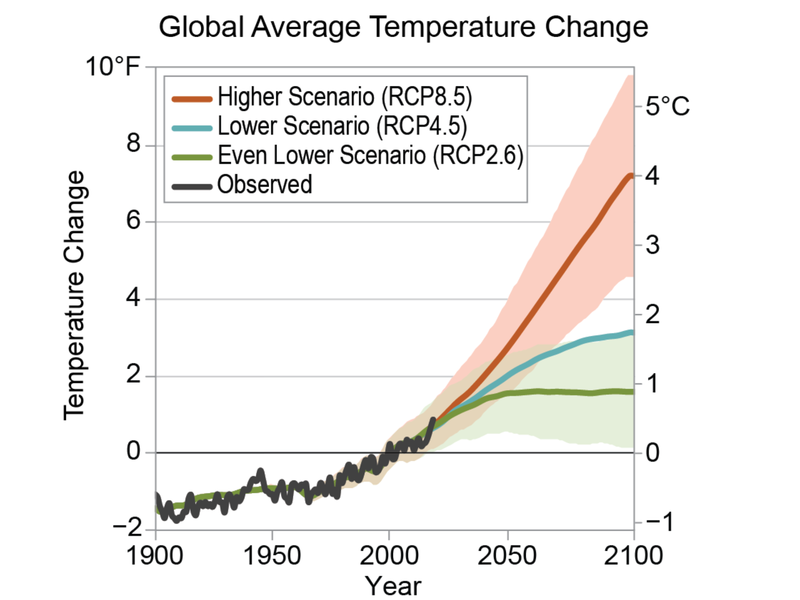 The loss in RCP 8.5 in 2090 is about $155 billion a year, but in RCP 4.5, it is half of that. The Orange dots are the 455 Cities Supporting Emissions Reductions. Note the concentrations in the Northeast, Miami waders, Denver, Seattle, Portland, and in California, San Diego, Los Angeles, and San Francisco and North. 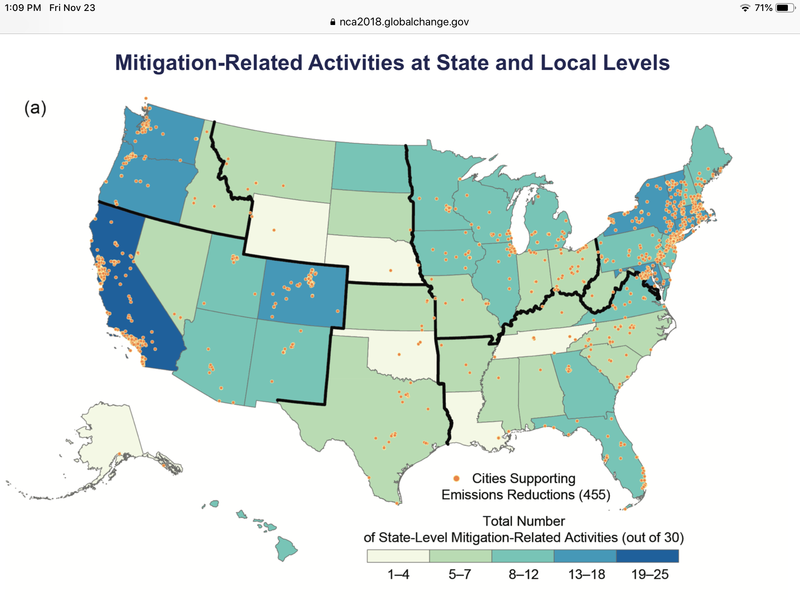 The states are shaded in green-blues by the number of subjects in which they have mitigation-related activities. Dark-blue California stands out with 19-35 activities, followed by Blue Washington, Oregon, Colorado, New York, Vermont, Connecticut, Rhode Island, Massachusetts, and Maryland. The biggest loss under RCP 8.5 is the loss of labor at $155 billion a year, which can be cut by 48% under RCP 4.5. Beneath this is Extreme Temperature Mortality, costing $141 billion, where 58% savings can be achieved under RCP 4.5. 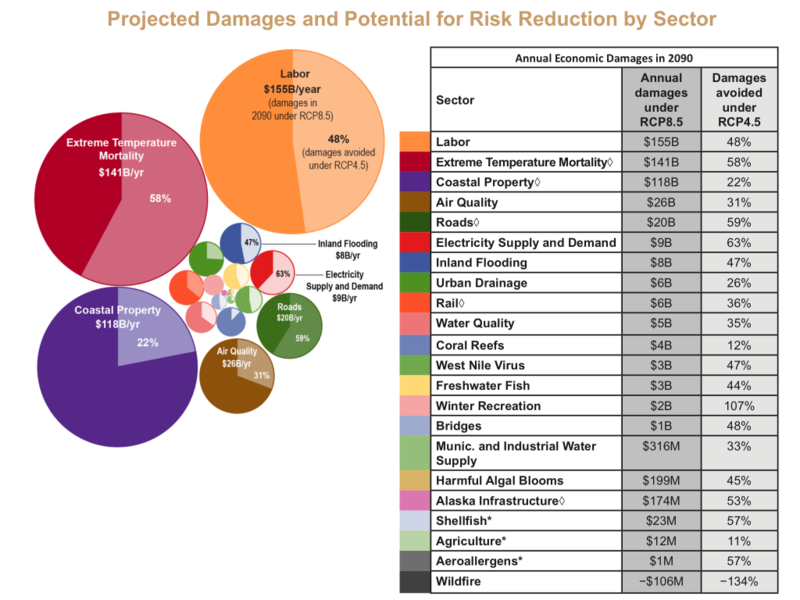 Next comes Coastal Property loss at $118 billion yearly, which can be reduced by 22% under RCP 4.5. The circles show the relative sizes of these damages, and the lighter sectors are the amounts saved by holding greenhouse gases to RCP 4.5. A graph to 2015 in the report shows as many acres have been destroyed by wildfires caused by climate change as those without it. In the future, by 2050, 6 times as much acreage will be burnt because of climate change, than without it. The RCP 4.5 by 2100 has a rise of 1 foot to 3 feet. Extra Antarctic melting can extend this to 4.5 feet. RCP 8.5 by 2100 has a rise of 1.5 feet to 4 feet, and extra Antarctic melting could extend that to 8 feet. The extra melting is not an established occurrence at present. Since climate change has become a political subject, with a Republican President and Republican Party committed to keeping the public from learning the challenging truths, we have to comment on the timing of the report’s early release. The literally Fox News run White House chose to bury the report on Friday, when people are about to enjoy the weekend, and news gets the least attention. It also is the Thanksgiving weekend, and the cross-state football playoff weekend. The thing about climate change though, it does not take holidays. Trump made the usual extremely non-scientific confusion of Weather at one area to Climate, to say the cold Northeast record for Thanksgiving shows climate warming is gone. The worst part of this, though, is that he leaves shivering New Yorkers and Washingtonians, and flies to warm 80º Florida in Air Force One to golf at taxpayers expense. Trump and his administration have adopted a one-line dismissal of the report, that is is based on an “extreme” case. That case is RCP 8.5, which is actually the “Business as Usual” case of what will happen if we do not switch to clean energy. Not surprising is the hypocrisy of Trump, since this is exactly the approach that he and his climate denying mob of political appointees is forcing on the federal government, on America, and even on states that want to be green. It also is a lie about the real report, which also considers the case of RCP 4.5, where we significantlly cut our greenhouse gas emissions, and the temperature rise is less than half that of Business as Usual. CNN and MSNBC did spend a minute covering our climate future, but spent most of the hours on the possible election collusion of two and a half years ago. Is this report why Trump started putting down climate change daily for the last few days? This entry was posted in Cladding Fires, Clean Energy, Climate Change, Climate Education, Climate Science, Congress, Donald Trump, Economies, Fire Risks, Fossil Fuel Energy, Greenhouse Gas Emissions, Mayor's Climate Action Plan, Paris Climate Accord, Paris Climate Agreement, Sea Level Rise, Trump Administration, Trump on Climate Change, US Climate Mayors. Bookmark the permalink.